Students at Topeka High, Highland Park and Topeka West now have an easier way to report crime. 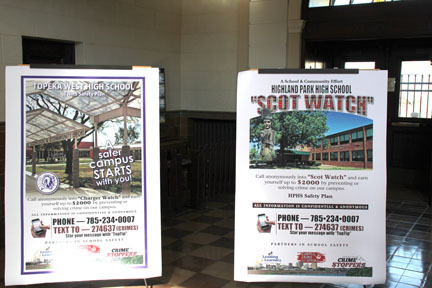 At the monthly SafeStreets meeting today, the program called Trojan Watch at Topeka High, Scot Watch at Highland Park and Charger Watch at Topeka West, was announced. Students can text a tip to 274637 and start their message by saying top tip, or they can call 234-0007 or go to the Crime Stoppers website to report a crime anonymously. A crime tip could mean a $2,000 reward. Representatives from Crime Stoppers, Safe Streets and Topeka public Schools spoke at the meeting. Topeka High, Topeka West and Highland Park High School will all have posters and other information regarding the new texting program.